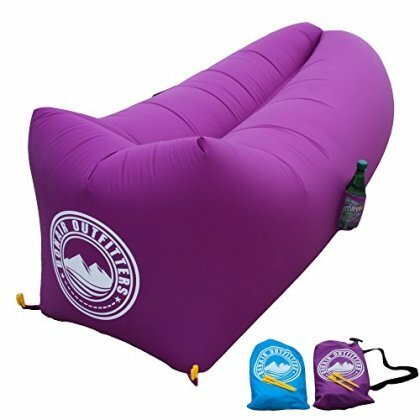 [2nd-Generation] Rapid Inflation Air Lounger With TPU-Coated Air Bladder. Lightweight Parachute Ripstop Fabric. Fold-Away Chillout Lounger, Air Hammock For Beach, Camping, Pool Party And Indoors. NO PUMP REQUIRED RAPID INFLATION. - New design features single air bladder which makes inflating the air lounger a breeze. Leak-proof TPU coated inner lining replaces leaky plastic lining from previous generation. Simply hold it against the wind, fill up, and then roll up. -- 2x times faster inflation than last generation product. STAYS STRONG SUPPORTS UPTO 450 LBS. - Proudly crafted with Parachute Ripstop Nylon for maximum strength. -- 2x times stronger and more durable than last generation product. STAYS GROUNDED. - Anchor air lounger to the ground with 2 tie-down loops. Stakes included. LOUNGE IN MAXIMUM COMFORT AND STYLE. - ComfortSmart features Square Headrest and silky smooth fabric that's soft to the touch. This might be the closest thing to laying in the cloud. (Don't forget to set an alarm). STAY IN STYLE: 3 color-matching side pockets: 1 for your drink, 1 for your phone, and 1 for your tablet or book. LIGHTEN UP YOUR BEACH TRIP LOAD WITH LIGHTWEIGHT AIR LOUNGER. - Getting rid of bulky and heavy beach chairs will free up your bag so you can pack other more important gears. Air lounger folds up compactly and pacts away with carrying bag. -- 40% lighter than last generation product. U.S. STOCK AND FAST SHIPPING. - At Bonair Outfitters, we value your trust the most. We never compromise on quality because you deserve the best in outdoor equipments. Go further with premium high-quality gears. 100% SATISFACTION GUARANTEE with 3 year unlimited warranty.